During the processing of the Free Application for Federal Student Aid (FAFSA), the U.S. Department of Education will select some of the applications for a process known as “verification.” Certain inconsistencies found when processing the FAFSA may increase the likelihood that the application will be selected for verification. Some of the FAFSAs submitted are also randomly selected for verification. You might see a note on your Student Aid Report saying you’ve been selected for verification. Texas Southern University will be notified electronically by the U.S. Department of Education when a FAFSA is selected for verification. By federal guidelines, TSU also has the right to select any application where it may detect inconsistencies. If you’re selected for verification, don’t assume you’re being accused of doing anything wrong, but do understand that your information will be reviewed. If the initial review does not resolve the inconsistent information, you may be asked to supply additional or more detailed information. TSU must resolve any inconsistent information prior to the disbursement of aid. During the verification process, students are generally required to verify data elements included on the FAFSA. Examples of the data that may be verified include, but are not limited to the adjusted gross income, federal taxes paid, SNAP benefits, social security income, or completion of high school. In some cases the amount of child support paid, social security benefits received, untaxed employment benefits and other non-taxable items may also be verified during the process. Dependent students will be required to submit parental as well as their own information during the verification process. Married students will be required to submit spousal information during the process. Federal guidelines concerning marital status and dependency statuses will be followed in both cases when completing the verification process. For additional information you may refer to the Free Application for Federal Student Aid at www.fafsa.ed.gov. Texas Southern University has established a partnership with Inceptia to expedite the federal verification process. If your FAFSA application was selected for verification by the U.S. Department of Education, you will receive an email from Inceptia introducing you to the Verification Gateway. Your introductory email will be sent to the address listed on your FAFSA. If you did not include an email address on your FAFSA, a postcard will be mailed to the address listed on the FAFSA. Once your file has been received by Inceptia, you will receive an email from VGCS inviting you to log into the Verification Gateway. If you are attending the Summer session you will log into the Verification Gateway at http://www.verificationgateway.org/tsufa2019. If you are attending the Fall/Spring semester you will log into the Verification Gateway at http://www.verificationgateway.org/tsufa2020. Prior to logging into the Verification Gateway you will authenticate your identity and create a username and password. Students who were required to provide parental information on the FAFSA are required to have one parent also authenticate and create an account on the Verification Gateway. This parent will be required to e-sign or provide an ink signature once all documentation has been submitted. Both parent and student will need to create a secure username and password. Decide if you want to receive text messages and approve to e-sign. Access your Action List and begin the verification process (the list may consist of some combination of online forms and the request to upload specific documents to Verification Gateway). Your parent on the FAFSA will also need to e-sign your account- We cannot complete the verification process without BOTH signatures. Upon receipt of all required documents, Inceptia will begin the verification process. Students will be notified if there are any questions or if any additional documentation is required via email, text or postcard. Once verification has been completed, the student and our school will be notified. Please note that the verification process must be completed prior to receiving an award package from TSU. Failure to provide the requested documents could result in the delay or denial of financial aid. Inceptia will also assist with questions concerning your verification process. If you need assistance or have any questions about the verification process, please contact Inceptia, Monday from 8:00 am – 8:30 pm Central and Tuesday through Friday from 8:00 am – 7:00 pm Central at 888-374-8427 or by email at VGCS@inceptia.org. It is very important that you log in and review the Verification Gateway during the verification process. On occasion, additional documentation may be requested after receiving the initial documentation from the student. Students will be notified by letter of any additional requirements. If inaccuracies are found during the review process, corrections will be forwarded to the U.S. Department of Education prior to the disbursement of any financial assistance. In some cases, files are selected for verification after the disbursement of financial assistance. Once the university receives such notification, additional disbursements will not be processed until the verification process is completed. If you didn’t use the IRS DRT, or if you filed an amended tax return and used the IRS DRT, your school may require you to submit a tax transcript as part of the verification process. You can find your tax transcript through the IRS’s Get Transcript service at irs.gov/transcript. You may return to your Free Application for Federal Student Aid and use the Internal Revenue Service Data Retrieval Tool (IRS DRT). By doing so, you may reduce the number of additional items TSU is required to collect during the verification process. The IRS DRT is available on the 2018–19 FAFSA form for eligible individuals. (You’ll need an FSA ID in order to use the tool.) However, the tool is not available on the 2017–18 FAFSA form. Find out how to fill out the 2017–18 FAFSA form without access to the IRS DRT. Certain applicants financial may require special consideration due to an inability to secure the parent’s financial information. Others household circumstances such as a significant reduction or loss of income, or exorbitant medical expenses may warrant additional consideration. The U.S. Department of Education has made certain allowances to assist students in completing the application process. You may contact the Office of Student Financial Assistance for assistance in understanding and assembling the documents required to submit your case for review. Forms are available on the TSU website for students who are challenged with obtaining parental information. Families with a significant reduction in the income may submit the special circumstances form. Cases for special consideration generally require additional documentation. Once the documents are received by the Office of Student Financial Assistance a determination will be made within 14 working days. Students are notified of the decision by letter within 14 working days of receiving the information. Beginning the process at the earliest possible point to allow for ample processing time is critical. 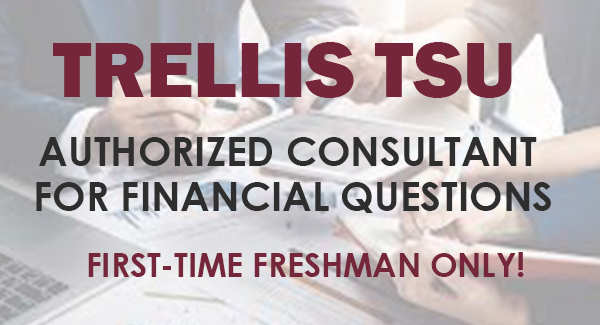 If you would like to set up an appointment with a FA Counselor to discuss your case, please go to the financial aid web page to select the time and date for your consultation. 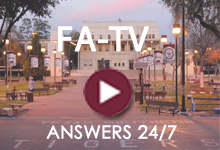 The U.S. Department of Education is requiring Texas Southern University (TSU) to review your Free Application for Federal Student Aid (FAFSA) information and verify the data entered on your FAFSA is accurate. We complete the verification process by comparing FAFSA data with federal tax documents and other forms you must provide to the TSU Office of Student Financial Assistance. Corrections to your FAFSA may be necessary if discrepancies are found. Generally, verification documents should be submitted as quickly as possible to allow for processing time. Verification documents submitted within 1 month of the start of the term will be processed in time for the respective payment deadline. Although TSU will make every effort to process all paperwork received, information received within 1 month of the close of the term may not allow adequate time for processing. For full consideration of all aid resources, required verification documents need to be submitted for review to the TSU Office of Student Financial Assistance no later than 45 days after the initial request for information. Verification documents received after the 45-day deadline can still be verified, but the types of financial aid offered may be limited. The Office of Student Financial Assistance must complete verification before the end of the academic year, or before your last term of attendance in the year, otherwise you may not be eligible for financial aid, including aid already disbursed. For consideration of federal student loans, your file must be completed, awarded and loans acknowledged prior to the last class day of the term. Not every student selected for verification will be required to submit the same verification documentation. Generally, most students will require at least a verification worksheet and copies of the tax information, wages earned or untaxed income during the process. Additional items may be required based on your individual application and family’s personal circumstances. Please review your financial aid eligibility requirements on your MyTSU account to see what verification documents have been requested. Please provide the TSU Admissions Office with a copy of your final official HS transcript, certification of passing scores on GED and similar equivalency tests or other alternatives to satisfy the high school completion requirement. For the Identity & Statement of Educational Purpose, please refer to the form found in the TSU forms bank for detailed instructions. The verification worksheet must be completed and submitted along with documentation of your federal income taxes, untaxed income, benefits, and wages. For complete information refer to your TSU MyWeb account. Please do not email tax documents to our office.